Hi! It is cool that you clicked on this link..because that means we can do some important work together. I’m Julie… and my friend Karen and I are in the process of starting a chapter at the high school in our school district. The great thing about having others join Kids for World Health is that together, we can discover even more ways to help make changes in the treatment of neglected diseases and save lives. Find a group of students who you feel would be interested and meet to discuss the facts and purpose of KFWH work. In other words, spread the word! We asked our Amnesty International Group and AIDS Awareness groups to join our effort and we met with other high school students from a neighboring school district to brainstorm ideas. At our middle school, siblings and interested friends were asking to begin their own branch and, of course, we were ready to help. It is important to gain support from the administrators in your building and to make an appointment to explain what you would like to do. An enthusiastic and interested teacher or administrator can serve as your advisor and will be helpful in getting things done! Next contact us to express your interest in starting a Kids for World Health group or chapter. You will receive a Chapter Certificate in the mail as well as a KFWH Starter Packet. Individual membership cards at $2 each are available on request. All information can be seen on our website including a Chapter Resource Guide. Our suggestion is that you begin by holding weekly meetings to brainstorm ways to create awareness, to plan fundraising events, to organize publicity and to explore ways to increase membership. These all take time but if you accomplish one of each of the aims of Awareness, Fundraising and Membership during the school year, consider yourself successful! Remember, every bit helps to raise the consciousness of people throughout our nation and world. Every ounce of energy spent is important to the lives of those waiting to receive treatment! Find a group of friends and spread the word! Send a representative to speak to your administration about your plans to begin a chapter. Find an advisor who you feel comfortable with. Schedule a first meeting to review the materials and to spell out the goals. Send in your membership contribution and contact us. Begin brainstorming ideas for Awareness, Fundraising and Expansion. Read posted suggestions and ideas on the KFWH website. Send us your story to post on the “Message Board” in the “Student Exchange”. Go to the Web to follow the growth of KFWH and the effect your work is having! Sponsor a celebration to honor the work that you have done! It is so important to get the information out so that changes can be made! One idea is to create a group exhibit to display somewhere in your schools, community and/or places of worship. Encourage others on your grade by giving a talk to the group. 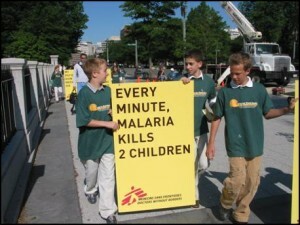 Make posters of the main facts about neglected disease and about our target diseases to display in a high traffic area! Study the links and informational data on this website or find others for all of us to learn from! Write letters to the President and to Congresspersons (see Links for addresses), and let them know that you are concerned about the lack of affordable and effective medicines for diseases like Buruli Ulcer, Chagas Disease, and Leishmaniasis, and Tuberculosis. Tell them about the great need for research to find new and better drugs for developing countries. Write to the major pharmaceutical companies urging them to reduce the prices of life-saving medicines to the lowest possible cost in developing countries. Ask them to invest more money in finding new drugs for fighting infectious diseases that are affecting the poor. Create a powerpoint presentation and present it to other interested students and adults! Sign a petition to the President and Congress. Find some local publicity to advertise your efforts and to get our message out to the public! Contact us for ideas for speakers for large groups in your area. Post your ideas on our Message Board Forum in the Student Exchange. Letters representing KFWH must be approved simply by contacting our Contact Us link. In some schools, fundraising for charitable purpose is not permitted. But if the fundraiser is held apart from the school within the community or place of worship it is easy to do! This is important to check before you set a place and a time. 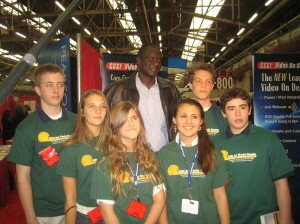 Kids for World Health is its own organization and is not officially affiliated with any school system. These are always fun! Everyone loves them, and they are easy to organize! We were able to make $400 before and after school on Voting Day! Siblings from the elementary school came over to help, so there were kids of all ages involved. We found that bakeries and stores in the area were very willing to donate goods! It is important to always send a note to those who helped with their donations. This can be a real group event…takes planning and supervision…but the dollars roll in! We are looking into a special event with artists from Lincoln Center. Many times people are willing to perform for a cause that they believe in. It is important to write letters that are thoughtful and that can help explain our purpose. We send out our Mission Statements pamphlet (which you can copy) along with a cover letter. Of course, a thank you for anyone’s time shows you know your stuff. It is important to represent Kids for World Health in an articulate and thoughtful way. Since we as youth, are working on this together, it is important to remember that everyone reflects the organization as a whole. We haven’t done this as yet but it is in our plans. Many organizations have done well with this type of event and find it to be a fun day as well! Almost always, someone knows someone who may be in a position to help. Artists, rock stars, Gates, someone is out there! Corporations often have foundations and grants for organizations who are educating others on a topic like global awareness. Just call the corporations in your area for information on who to contact…and who knows…you may be able to encourage others to make a difference too! If you need support, contact us with your contacts and we will write the letters from our home office. Place in stores with information labels is one of our favorites. Of course, committees need to ask store owners and make weekly collections of funds. For safety and privacy reasons, please do not organize anything which could be unsafe or inconsiderate of others. Door to door sales are not an event. When your fundraiser is complete, send us a check or money order to Kids for World Health. We will follow with acknowledgement of receipt. Should a donor be a corporation or independent person, please enclose the name and address of the donor so that a formal letter can be sent to them to guarantee their tax-deductible status. This is a very important step for all concerned. Your suggestions will help the rest of us! Please remember to write us about what worked for you on our Message Board and send us photos online to share. For privacy reasons, please do not write names on photos, just the place and the event. Speak to other classes and groups within your schools, community and places of worship. Educate the groups on the issues and explain to them about membership opportunities. Write to friends and/or penpals in other schools. Spread the word and the importance of contributing to families and friends in our world. Invite others in your school, place of worship or community to join your group. Notify doctors of your project and ask them to become involved. Post other ideas for all of us to see and try!